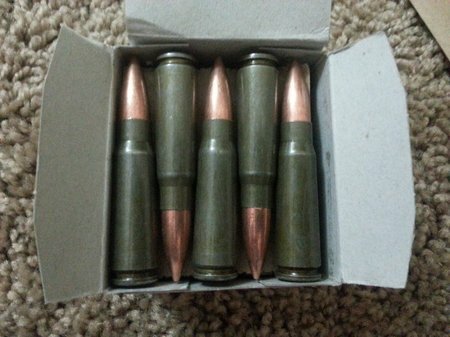 Where to buy 5.56 ammo on sale in a 1,000 round case for $225.00? If you’re looking for a great deal on a 1000 round case of 5.56 Nato then you have a few options. 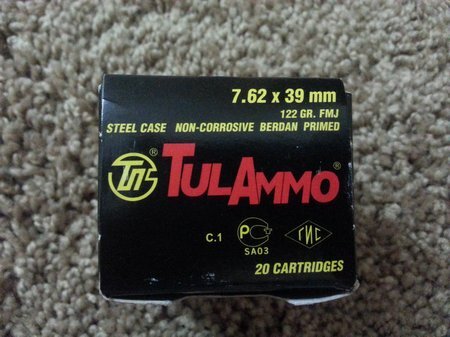 The best price/quality is definitely Tulammo at $225/case of 1000 rounds. 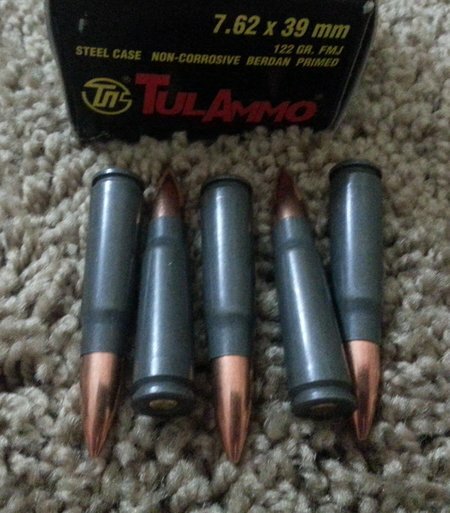 Tulammo 5.56 Nato/223 ammo is loaded with polymer steel cases and bimetal FMJ bullets. It has non-corrosive primers and powder and is very clean burning. The steel cases are safe for all modern firearms. The steel case is soft or annealed so it can expand during the firing process to seal the rifle chamber. It will not harm your gun. Your second options is Wolf WPA Military Classic 223/5.56 ammo in 500 round sealed packs for $139. Wolf 223 ammo is quality ammo featuring polymer coated steel cases with FMJ bullets. The steel cases are mild steel and much softer than a rifle barrel. It will not harm any barrel. 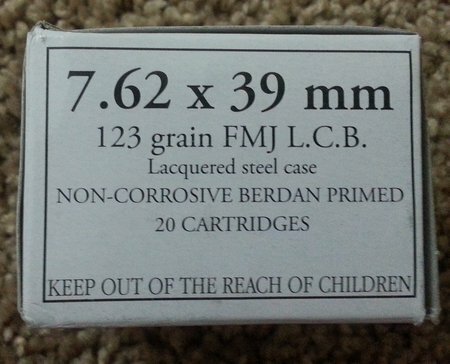 The primers are non-corrosive and are berdan style. WPA ammunition is manufactured in Russian, Ukraine and Serbia in some of the largest ammunition plants in the world. 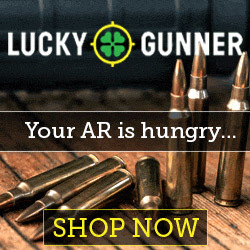 Here is where you can get great deals on 5.56 ammo…Wolf 223 Ammo For Sale 500 Round Packs at Lucky Gunner.com. Super fast shipping and great customer service. The more I read about steel cased ammo the more I’m intrigued by it. The JSC Barnaul Machine Tool Plant is one of the largest ammunition plant’s in the world. They do not product garbage nor cheap ammunition as some would lead you to believe. Barnaul is actually pretty high tech. Steel cases require tighter tolerances than brass. Brass cases are more forgiving and easier to work with. They primarily produce military ammunition and shotshells. They strive to product the highest quality ammunition at a very affordable price. The quality of Barnaul ammunition is regulated and certified by the International Quality System ISO-9001. Barnaul takes great pride in their products and offers a replacement or money back guarantee on their ammunition. It the ammunition fails to perform as they certify and you have fired no more than 20 rounds from a 40 round order or 10% of a larger order, return the ammunition with original packaging and receive either a replacement or a full refund. Dispersion group of 50 rounds not to exceed published figures (accuracy) 7.62×39 hollow point = 3.15″ at 100 meters. Now lets talk about steel cases. So why steel cases? Is it just the cost? NOPE….cost is not the only reason Barnaul uses steel cases. 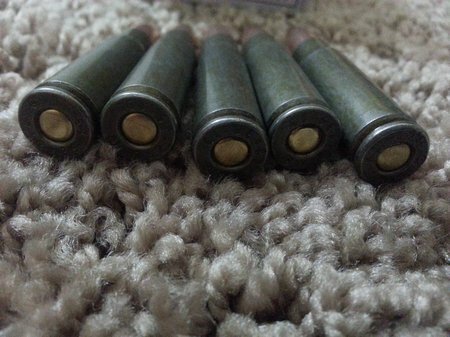 Barnaul uses bimetal bullets in their ammunition. The bullet jacket is specially designed and manufactured from low-carbon steel. It is coated with copper and then double heat treated. 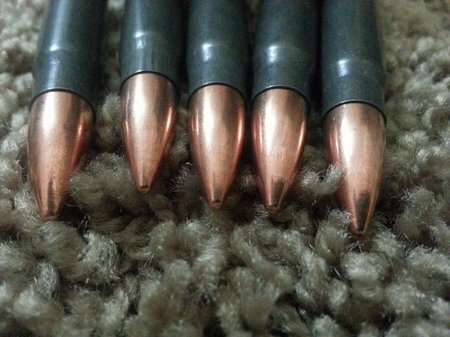 These bimetal bullets look and behave like copper jacketed bullets. Barnaul uses low smoke propellants specially formulated for steel cases. These powders or propellants deliver lower pressure combustion with consistent burn rates. Let’s set something straight here about Wolf Ammunition. Wolf does not manufacture ammunition but imports it from many countries and many ammunition plants (Tulammo, Barnaul, etc). 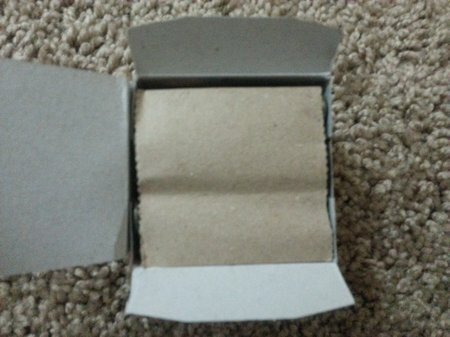 They package it under their own brand. Wolf Performance Ammunition or WPA ammunition is mostly manufactured by Tula Cartridge Plant in Tula, Russia. Tula Cartridge Plant was founded in 1880 and is one of the largest ammunition plants in the world. 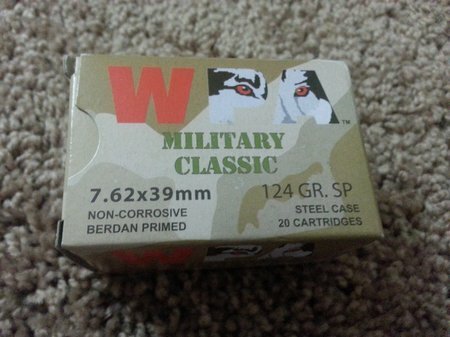 However WPA Military Classic ammunition is manufactured by Barnaul. 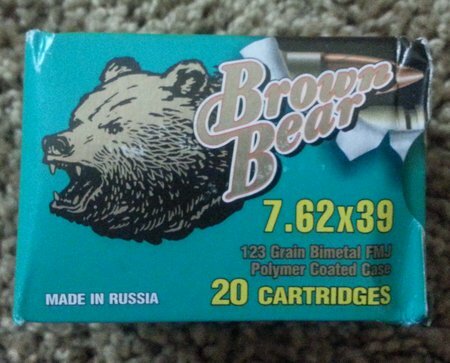 I looked at the head stamp on the steel case and it matches the cases of Brown Bear ammo from Barnaul. Other Wolf ammunition has Wolf stamped on the case. 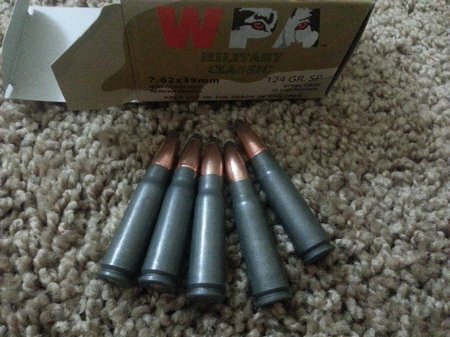 WPA Military Classic ammunition is polymer coated steel cased to prevent corrosion and to assist with smooth feeding and easy extraction. Wolf previously used a lacquer coating but negative publicity about the lacquer melting and causing cases to stick in the chamber caused them to make some changes. The lacquer coating does not melt nor make cases stick in the chamber. It is still used by some ammunition manufacturers like Klimovsk and Golden Tiger and works very well. Packaging is very nice. 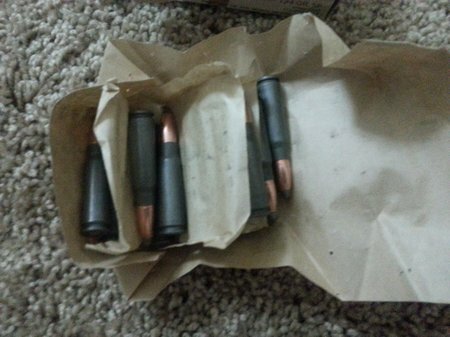 20 rounds are stacked and wrapped with brown paper and stapled on each end. 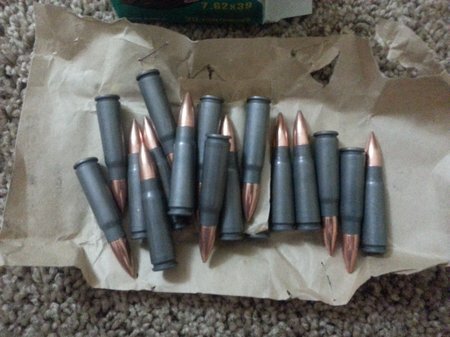 20 rounds of WPA Military Classic 7.62×39 unwrapped. Quality is excellent. Cases are perfect..no scratches, dents, blemishes, etc. These are 124 grain bimetal soft points. 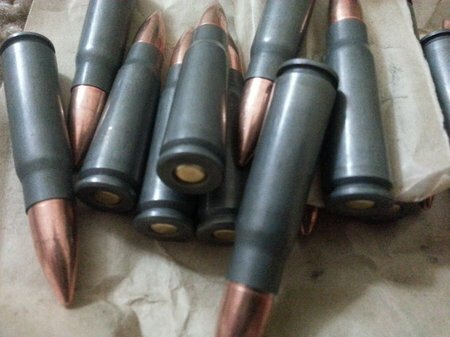 The bimetal bullets are steel jacketed with copper plating. The core of the bullet is lead. Notice there is no bullet shavings at the case mouth. I see some ammo with copper shavings at the case mouth. This is caused by improper case preparation. Really nice ammo. I was not expecting it to be this nice looking, at $7.00/box. If you buy a case of 1,000 rounds the price drops to $.23/round instead of $.35/round. Here is where I bought this ammo. Great prices, inventory and fast shipping. 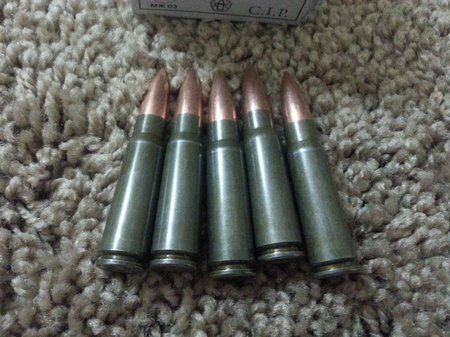 I went one step further in my visual inspection/review on WPA Military Classic 7.62×39 ammo. I weigh each loaded round to see what kind of variances there might be. High quality ammo has very little variances in weight of the components. I used a digital powder scale to weigh each loaded round. 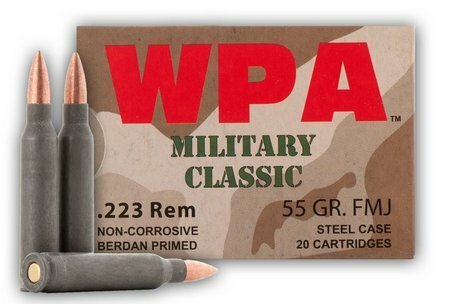 The average weight of the WPA Military Classic 7.62×39 ammo was 252.97 grains. The low was 250.8 grains and the high was 254.4 grains. The low was 2.17 grains from the average while the high was only 1.43 grains away from the average. That’s pretty darn good. Consider all of the components in one loaded round and 1 to 2 grains is nothing. A bullet alone can be 1 grain heavier than its reported weight. Cases can also be 1 or 2 grains apart. As soon as I receive my Zastava AK-47, I will be shooting this ammo for accuracy and reliability. Here is a demonstration of Wolf 5.56 ammunition in various AR-15 type rifles. 100% reliability. 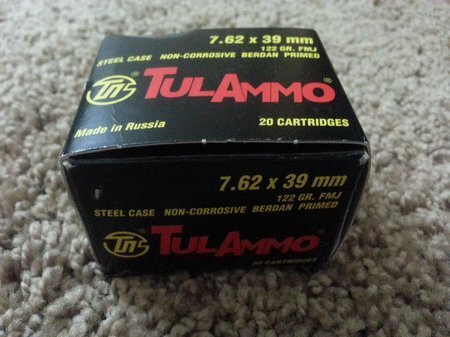 Tulammo ammunition is manufactured in the Tula Cartridge Works plant in Tula, Russia. It was founded in 1880 and is the leading Russian ammunition factory as well as the largest supplier of ammunition worldwide. The plant exports half of what it produces every year. Tualmmo is imported from Russia and supplies may be limited because of the Executive Order Ban against Russia. Right now inventories are pretty good but it may not last long. Tula Cartridge Works has been producing ammunition for over 125 years. If their ammunition was not good, they would not be around today. 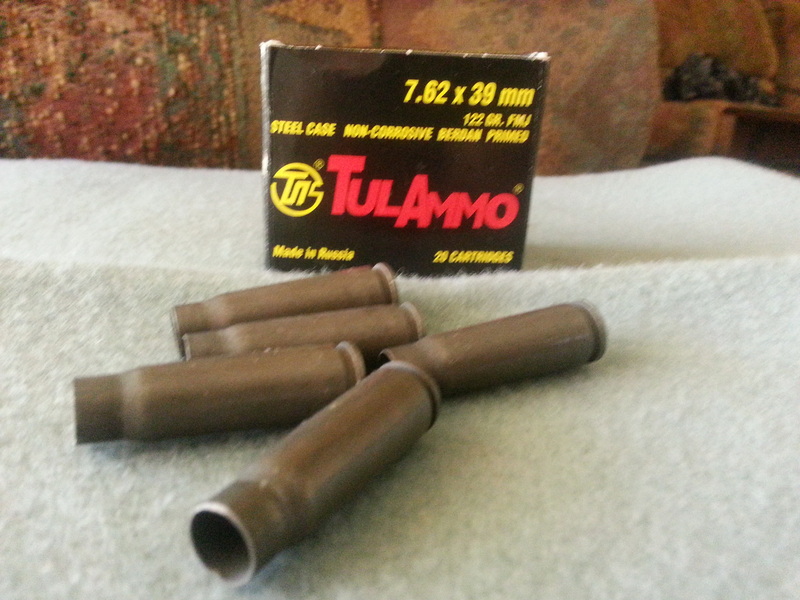 This is the Tulammo 7.62×39 122 grain FMJ ammo. It features a polymer coated steel case and a bimetal bullet. The bimetal bullet has a lead core, mild steel jacket plated with copper. It is not a Steel Core bullet. The core is Lead. The primers are Berdan style and non-corrosive. The steel case and steel bullet jackets are annealed or softened. They will not damage your guns. 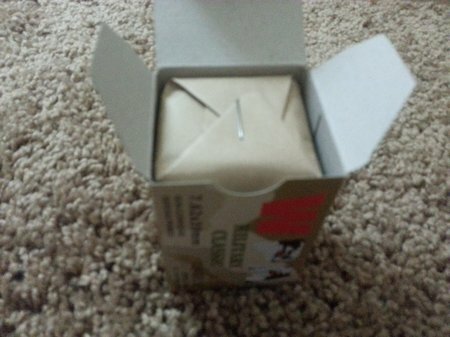 Open box of Tulammo. Paper separators for each row of 5 rounds. 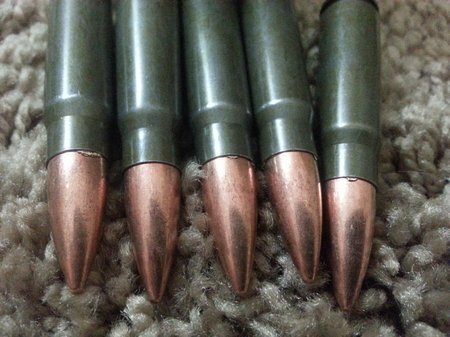 Steel jacketed or bimetal bullets can cause accelerated barrel wear. Depending on how you shoot your gun and what you clean/lubricate it with, you could wear out a rifle barrel in 6,000 rounds or 10,000+. The hotter the barrel gets, the faster it will wear out. Keep it cool and lubricated and it will last much longer. Very nice looking ammo. Clean, shiny with no dents, scratches, etc. 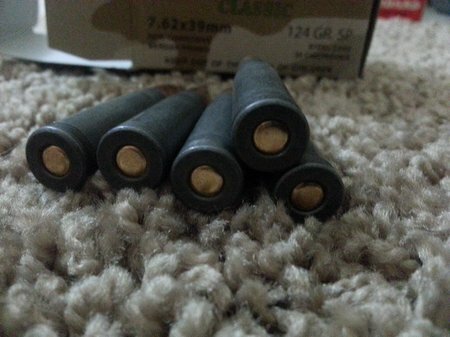 Perfect looking ammo. No bullet jacket shavings around the neck of the case. Case prep eliminates this kind of issue. Nice manufacturing controls. 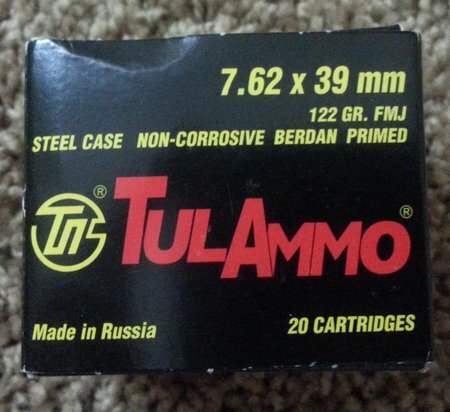 I have not shot any Tulammo 7.62×39 ammo yet but will in the next week or so. 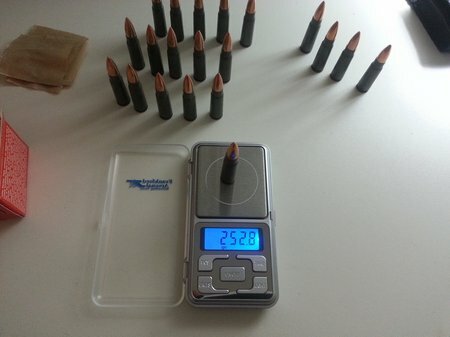 I wanted to see how precise this ammo is by weighing each loaded round and calculating the variance. Most high quality ammo has very little variance in the weight of each component and thus the entire cartridge weight. Here is the data I collected after weighing each round on my digital powder scale. 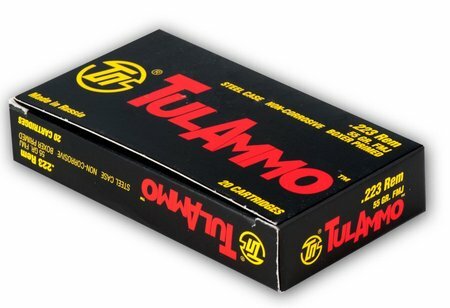 The average weight of the Tulammo 7.62×39 ammo was 252.9 grains. The low was 250.6 grains and the high was 255.3 grains. The low was 2.3 grains and the high was 2.4 grains away from the average. That’s pretty good when you consider that they use volume powder charge equipment to load ammo instead of a powder scale. 2 grains is not much. This tells you that they have good controls in their manufacturing plant. I’m excited about shooting Tulammo in my new Zastava AK-47. Even more exciting is the price of this ammo. 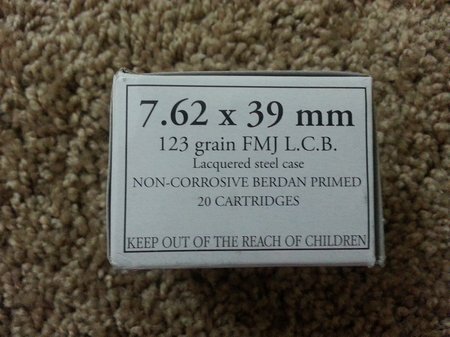 If you buy a case of 1,000 rounds it’s about $260 or $0.26/round. You can’t beat that anywhere. I also bought some Tulammo in 45 acp for my Glock 21. 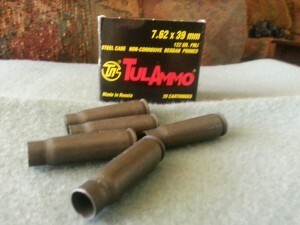 Here is where I bought the Tulammo 7.62×39 ammo….Tulammo 7.62x39mm Ammo at Lucky Gunner. They have great inventory that is updated and the best prices with quick shipping. 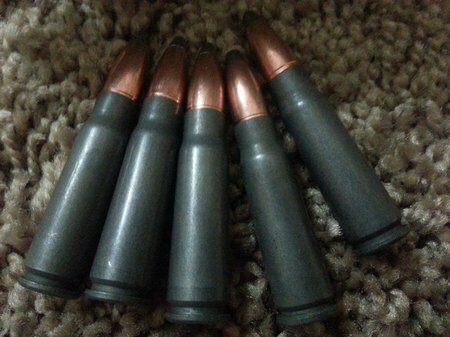 I went to the range and shot 5 boxes of 7.62×39 ammo which included some Tulammo. And I have to say that I am totally pleased and excited with Tulammo. It was 100% reliable in my Zastava NPAP Ak-47. Here are some of the empties. The polymer coated steel cases are pretty clean unlike what I have read. Many have said it was very dirty and covered with black soot. Surely not the case here. My AK-47 was barely dirty after 120 rounds. Wolf Ammunition or WPA ammunition is mostly manufactured by Tulskiy Patronniy Zavod or Tula Cartridge Plant in Tula, Russia. There are several product lines to include Wolf Polyformance, WPA Military Classic, Wolf Gold, Wolf Rimfire and Wolf Shotshell. Wolf and Klimovsk ammunition are imported from Russia and supply may be limited by the Executive Order Ban against Russian. You will find 3 different packagings in Wolf 7.62×39. 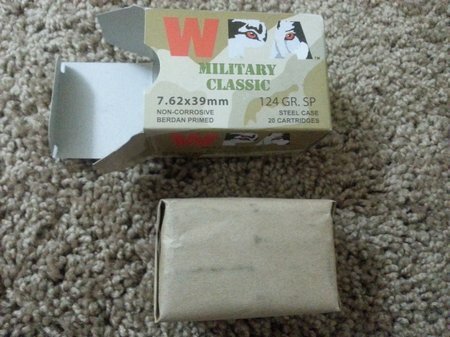 The black box Wolf Polyformance/Performance, the camoflauge WPA Military Classic and the “generic White Box”. 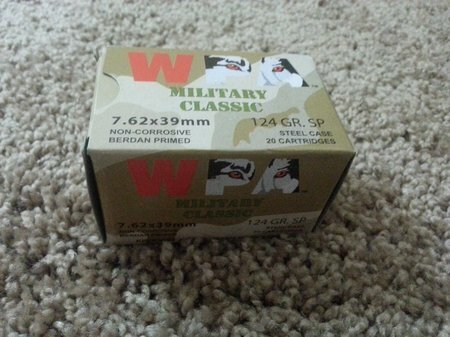 Generic White Box Wolf/Klimovsk Ammo – old production with lacquer coating. 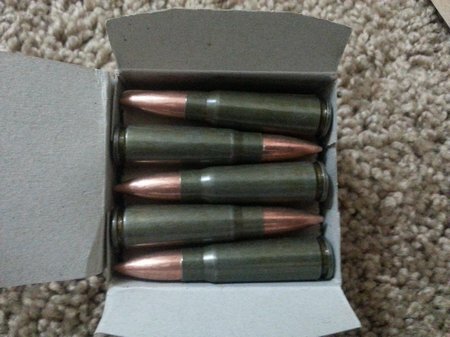 I bought this box of ammo as Wolf ammo but now that I have done some research it is actually made by the Klimovsk Specialized Ammunition Plant. 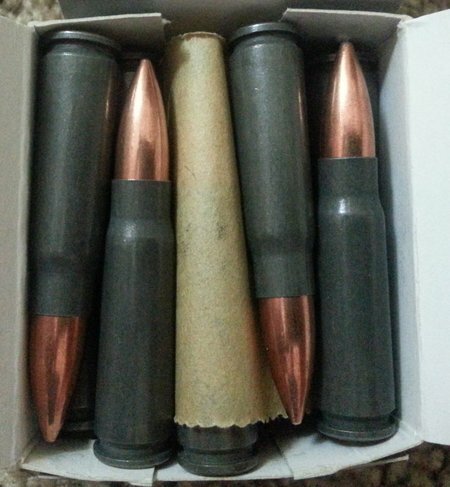 Klimovsk generic “White Box” 7.62×39 ammo. This batch or box is Lacquer coated steel cases. I beleive Wolf is no longer loading ammunition with lacquer coated cases. They are now manufacturing polymer coated cases only. 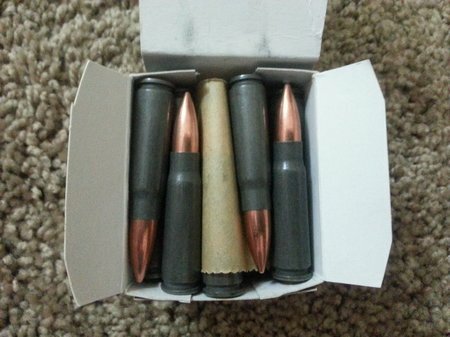 This box of ammo is however Klimovsk ammo. There was some negative talk about the lacquer coating melting in chambers and causing cases to stick. This is false and total myth. The case sticking claims were more likely caused by carbon blowing back between the steel case and the chamber. Steel cases do not seal the chamber as well as brass cases and allow combustion gases (carbon too) to leak past the case. 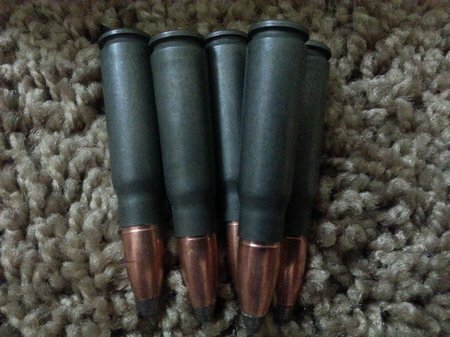 This carbon would accumulate in the chamber and action and cause some extraction issues on straight walled cartridges like the 5.56 Nato/.223 Remington. It is however not an issue on AK type weapons. The tapered 7.62×39 case and the tolerances of the AK rifle prevent any such issues. People claim Wolf ammo is “dirty”. It’s not dirty ammo. 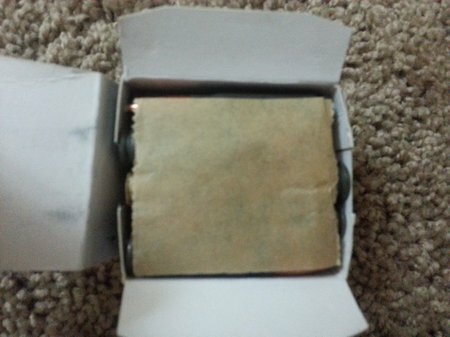 It’s the fact that the steel case does not seal the chamber and allows gas to blow back into the action. This makes it seem to be dirty when you look at the cases and the rifle action. 20 round white box with separator paper between every 5 rounds. Shiny and very slippery ammo. Nicely assembled. You can see a small amount of copper shavings by the neck of the cases (#1, #3 and #5). It’s not an issue with accuracy or reliability in an AK rifle BUT it proves that there could be some improvement in the reloading process. The case mouths may need chamfering. It’s a slight flaw but no reason to not buy and use this Klimovsk ammo. 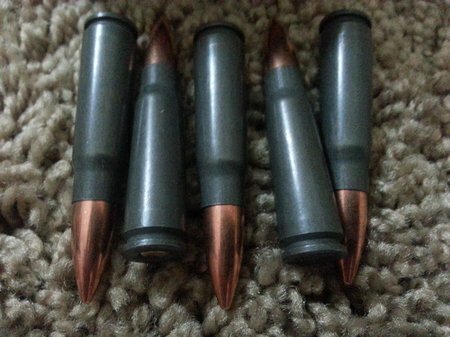 These are bimetal bullets. The jacket is mild steel plated with .005″ of copper. The mild or soft steel jacket is .032″ thick. 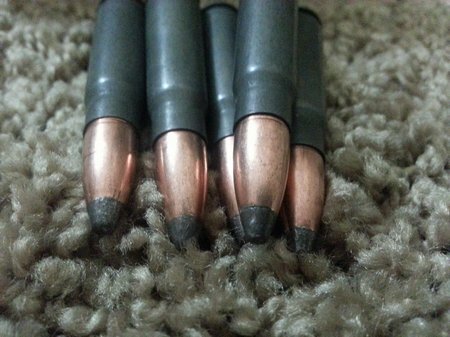 Bimetal bullets do wear barrels faster than copper jacketed bullets but how fast depends on your individual useage. Shooting any firearm until the barrel gets to 500 – 700 degrees will definitely speed up wear. Keep the barrel cool and use a top notch lubricant and you may exceeed 10,000 rounds before the barrel is worn out. The Klimovsk 7.62×39 lacquer steel cased ammo looks very good after inspection. I have not test fired it yet as I’m waiting on my Zastava AK-47 to arrive. As another degree of scrutiny, I decided to weigh each case and look at the variation in cartridge weights. If there is a large variation then I would think quality control is not very good. Quality ammo is very consistant. The average weight of a loaded round was 257.885 grains. The low was 255.3 grains and the high was 260.3. That’s pretty good. The low and high were only 2 grains from the average. That’s pretty consistent. Manufacturing controls seem to be very good. And people say this is junk ammo. Not hardly. 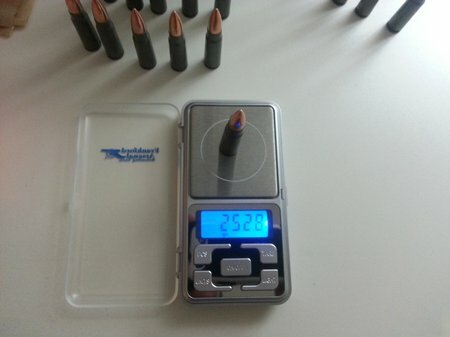 Here is my digital powder scale with a 7.62×39 round. 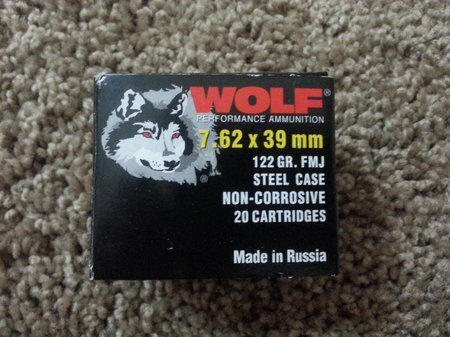 Here is where I bought this Wolf/Klimovsk 7.62×39 ammo….Wolf 7.62×39 Ammo at Lucky Gunner. Lots of inventory, great prices and fast shipping!